It is climate controlled with two furnaces and two air conditioning units. The dining room and sitting room are connected by a wide doorway, making it possible to use the two rooms together for meetings or dining. 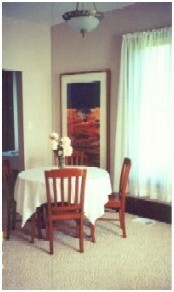 Stratton House Inn will accommodate up to 25 persons for group dining, meetings, and small conferences. Stratton House Inn will comfortably sleep 16 adults. The five bedrooms contain: one king-size bed, three queen-size beds, and one regular bed. 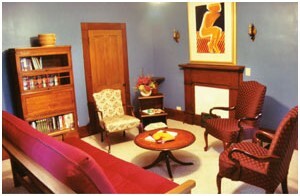 The Parlor has a modern, comfortable queen-size futon; and the Office has a couch with a pull-out, double-size bed. Additionally, the house has one twin-size bed with twin-size trundle, one twin-size roll-away, one antique day-bed, and one crib. The house has been completely remodelled -- and restored where possible. The original configuration of rooms has been maintained, with the following exceptions. The summer kitchen has been enlarged into a modern year-round kitchen and full bath. The old kitchen subsequently has become the dining room. The rustic attic has become a private suite with skylights, charming alcoves/dormers, full bath, and dressing room. And two additional full bathrooms have been added. Two sets of stairs lead to the second floor, one with 16 steps and one with 15 steps. A stairway with 12 steps leads to the third floor. Originally, many of the rooms were wallpapered -- some had many layers. And all rooms were fairly dark. Today, each room has been decorated by a family member removed four generations from the original Stratton occupants of the house -- and reflect contemporary tastes and use of color, while incorporating original furnishings and related antiques, where possible. Throughout Stratton House Inn are original works of art by Arthur Secunda -- a family friend. Secunda is an accomplished artist, teacher, and commentator on art -- he was a co-founder of Artforum magazine. He has had more than 90 major exhibitions of his work in museums and galleries in the United States, Europe, and Japan. His work is held by many major museums, including the Museum of Modern Art in New York and the Smithsonian in Washington, D.C. He is credited with starting the California "school of art," which is characterized by the use of rich colors. As a result, Stratton House Inn is a modern home -- remodeled and furnished for your current comfort and convenience, while grounded in tradition and respect for the past. It is a house to be used and enjoyed -- with appropriate care for all that Stratton House represents, both physically and in spirit. Captions: Top: Corner of the Parlor. Middle Left: Downstairs hallway and "Back" stairs - looking toward the front of Stratton House. 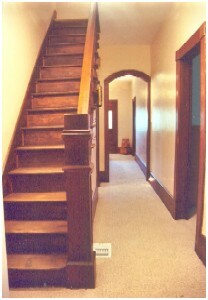 Immediately to the right is the door to the Office with the door to the Parlor visible at the other end of the hallway. Lower Right: Corner of the Sitting Room, with the doorway to the Dining Room visible at the left. 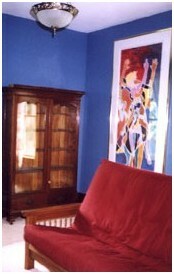 Bottom: Corner of the Parlor with Arthur Secunda's print, Sacre de Printemps.